Remember how the DSi's internet connection led cops to arresting a 13-year-old would-be slasher? Today, officers made another arrest. The boy's older brother. 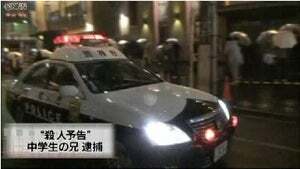 How The Nintendo DSi Stopped A "Killer"
Earlier today, police in Tokyo police arrested a 19-year-old man who was carrying a knife and running around near Shinjuku Station saying, "I'm going to kill someone." The 19-year-old was the older brother of the junior high school student who days earlier posted threats of a random stabbing online. "On February 11, at 9pm sharp, there will be random slashing at Shinjuku Station's highway bus entrance," the boy's message read. "You might want to sit this round out if you don't want to die. The police were able to trace the 13-year-old's online postings via his Nintendo DSi internet IP address and arrest him. A late night bus ticket was found on him, leading to speculation that the boy planned to escape to Osaka after the random stabbings. The junior high school student originally posted that there would be three attackers, but later told police that he acted alone. The Tokyo Metropolitan Police are currently investigating whether what motivation connects these two incidents.